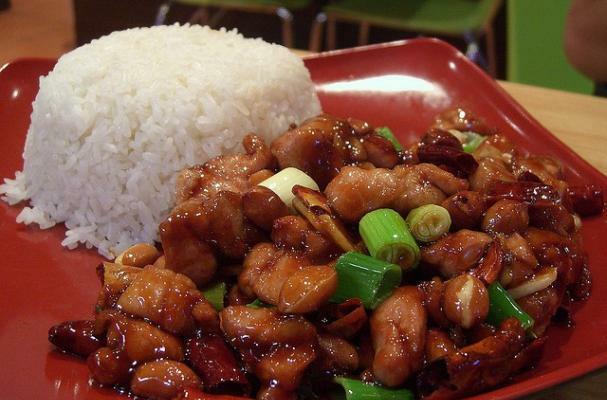 There are two things that make a delicious kung pao chicken: roasted peanuts and chili sauce. This recipe has both. Instead of spending money on take-out, heat up the wok and cook this dynamite dish at home. Serve your kung pao chicken with plenty of steamed rice. In a small bowl, dissolve 1 Tablespoon of the cornstarch in 1 Tablespoon of cold water. Combine with 1 Tablespoon wine, 1 Tablespoon soy sauce and 1 Tablespoon oil. Cut chicken into large chunks and place in a gallon Ziplock bag, pour marinade in bag. Seal, turn over a couple of times and place in refrigerator for about 30 minutes. Remove chicken from marinade and saute chicken in a large skillet until meat is white. Discard marinade. Meanwhile make the sauce: In a small saucepan, combine 1 Tablespoon wine, 1 Tablespoon soy sauce, 1 Tablespoon oil 1 Tablespoon water/cornstarch mixture, chili paste, vinegar and sugar. Stir until mixed. Add green onions, garlic, water chestnuts and peanuts and heat sauce slowly to a boil. Add sauce to skillet with chicken and let simmer together until the sauce thickens. Serve with rice and plenty of water to drink. Awesome recipe! Didn't have water chestnuts but the dish was excellent without it. Instead of white wine, I used sherry cooking wine, upped the garlic factor, used about a tablespoon of fish sauce. Instead of 30 min marinade, I just pounded the chicken and cut into tiny strips instead of cubing it and poured marinade ingredients into same bowl. Let it sit while I prepped the rest.